Cedar Sensation! This set of 3 Cedar Whiskey Barrel Planters is the perfect way to bring some of the natural elements back into your store. 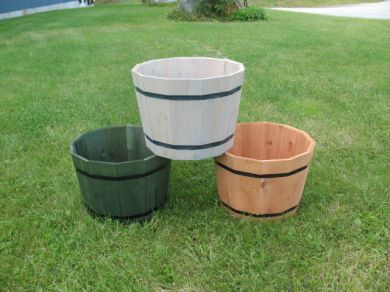 Rot resistant and available in 4 colors, these wooden bins are a beautiful way to show off your products. Fill them with bulk wrapped candy, sample size lotions, craft items, small hardware, and more. These cedar tubs are also great for floral displays. Why wait? Order your wooden tubs now!